Charmaine Kolwane Mrwebi is a poet, librarian, puppeteer based in Free State, South Africa. Her poetry effortlessly touches on the shared human experience of living, loving, hurting and hoping. She was part of the poet disciples who founded performance poetry in 2004 at the Performing Arts of the Free State under the mentorship of the late Thami Moleko. She has published two books, titled Omoseye Bolaji: channeling one’s thoughts onto pen a paper which is a literary analysis of the author Omoseye Bolaji ës works, her second book Poetry Commando which is a collection of poems, is her latest work. She is currently working on her third book which is a children’s book. 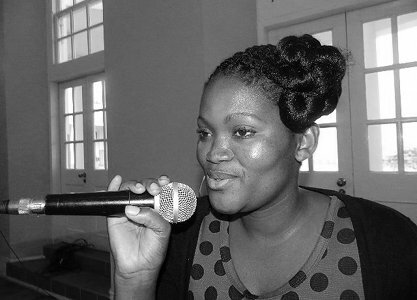 She facilitates a poetry club in Legae Intermediate School with 20 young poets from grade 5 to grade 8.